Hello there! Everyone having a great weekend? Mine has been wonderful. I have quite the Saturday recap for you, hope you’re ready. 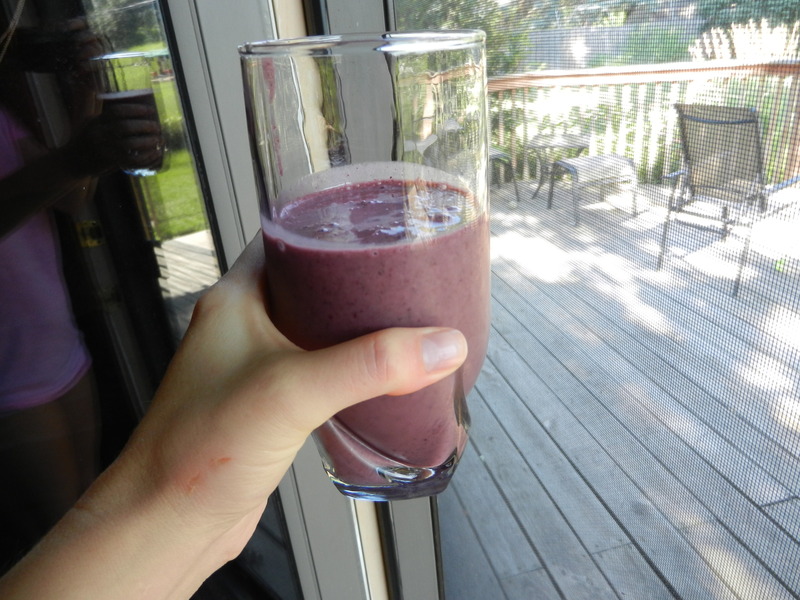 I blended up a fruity smoothie packed with strawberries, banana, cherries, spinach, yogurt, and sweetener. I also ate a spoonful of almond butter to pack in extra protein. 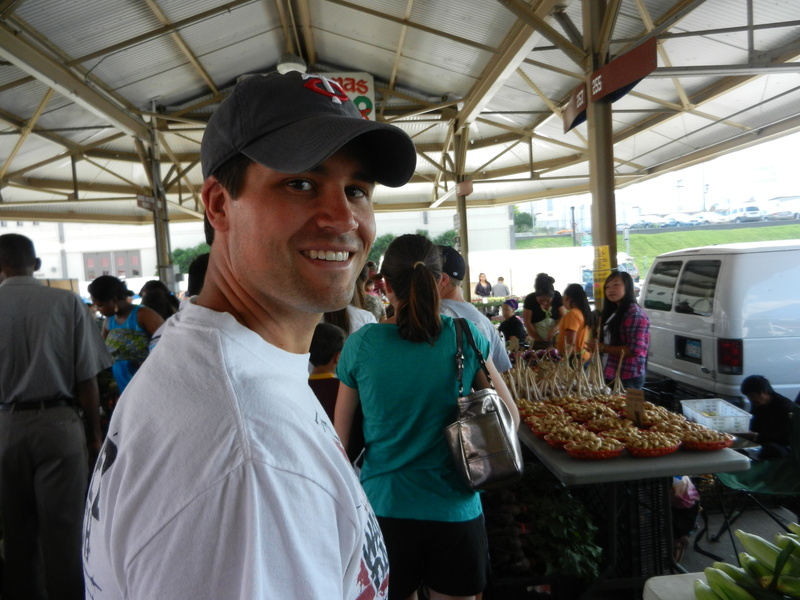 After breakfast we cruised on over to the big Minneapolis Farmer’s Market. 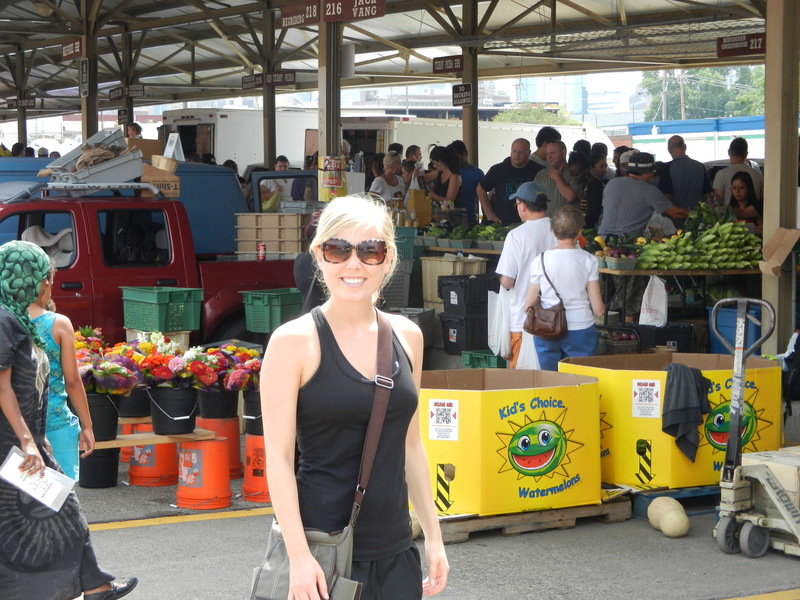 Holy cow I was in fresh vegetable heaven. It was so crazy busy but it always is. 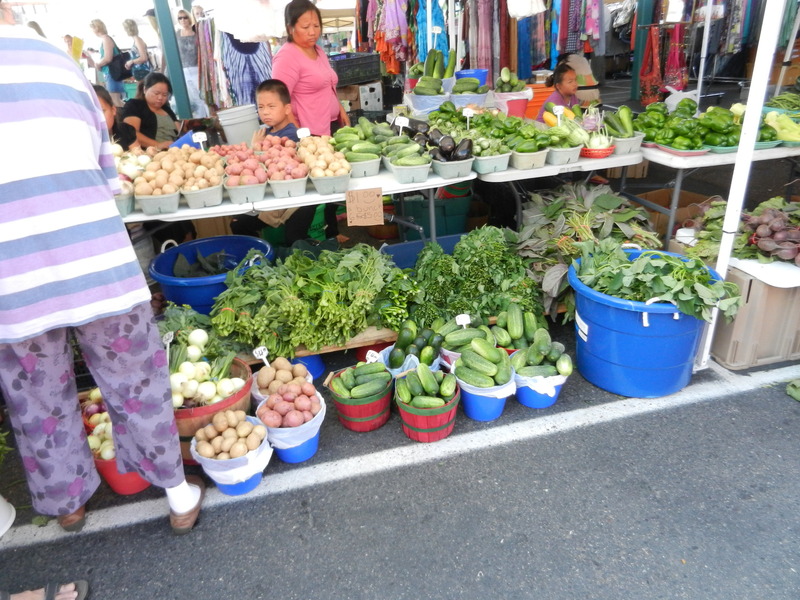 It’s always encouraging as a dietitian seeing SO many people at the Farmer’s Market getting excited about fresh produce. Let’s just hope they don’t go home and make them into fried green beans and buttered bacon mushrooms. 🙂 My brother Scott would say what’s wrong with that?! We ended up buying: onions, cilantro, carrots, Poblano peppers, grass-fed ground beef and bison. 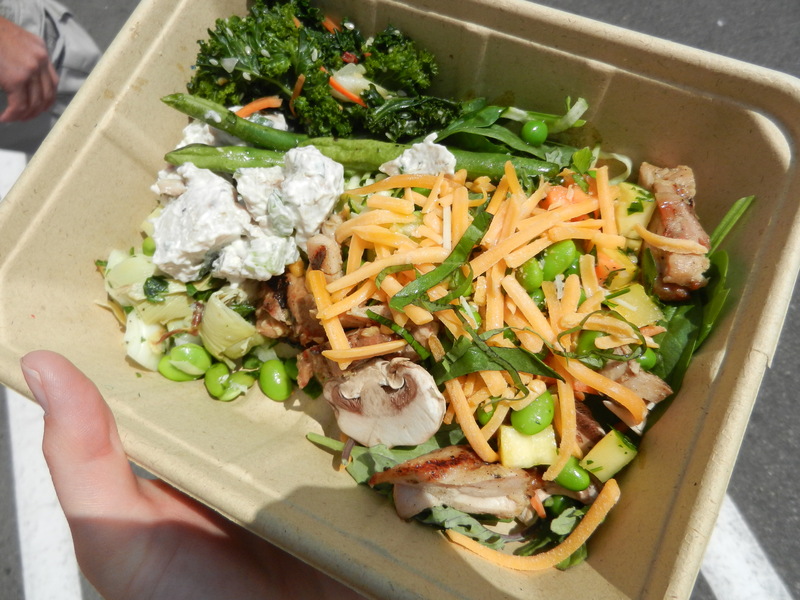 We were getting pretty hungry after all of that commotion, so on our way home we stopped at Whole Foods for their outstanding salad bar. 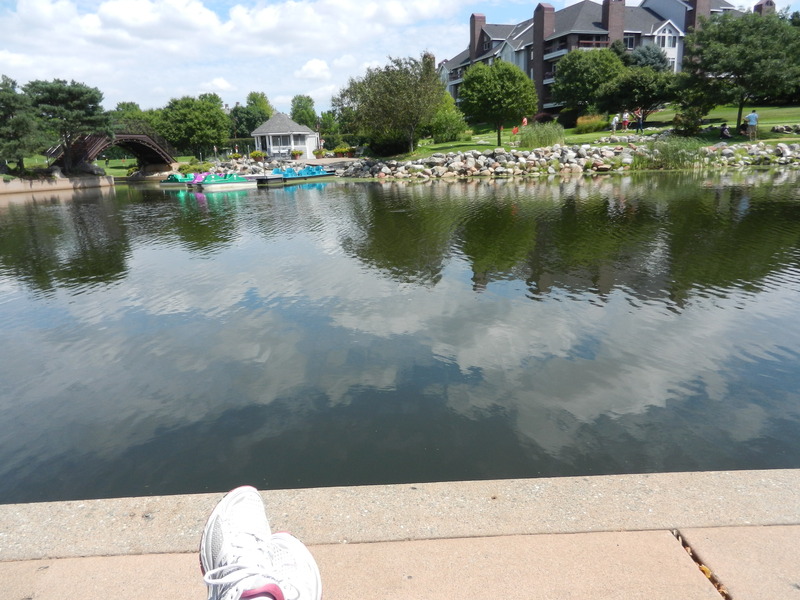 We enjoyed our salads at the beautiful Centennial Lakes. On our way home from lunch we drove by a few garage sales. We are thinking about buying a book shelf for our office and ideally would like to find a cheap one from a garage sale or Craig’s List, and fix it up if need be. No such luck at the sales yesterday, but we are keeping our eyes out. Back at home, I prepped for dinner. It was only about 2:30 in the afternoon at this point, but Dana and I were going to church at 5:00, so I figured I would get everything prepared beforehand, so that after church, we could just finish up the cooking process and have ourselves a delicious meal in no time. Dinner involved the fresh farmer’s market Poblano peppers. 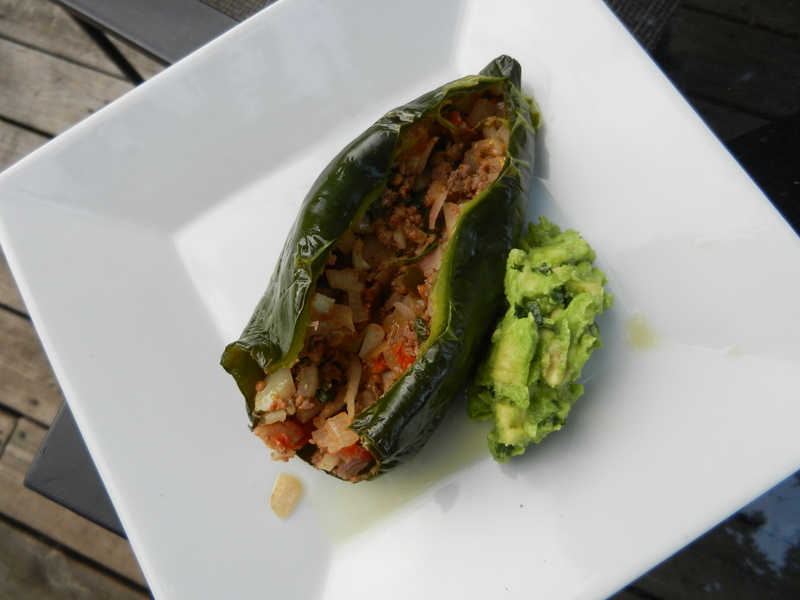 I began by cutting off the tops, deseeding the peppers, and baking them in a 400° oven for 15 minutes. ***MAJOR TIP! 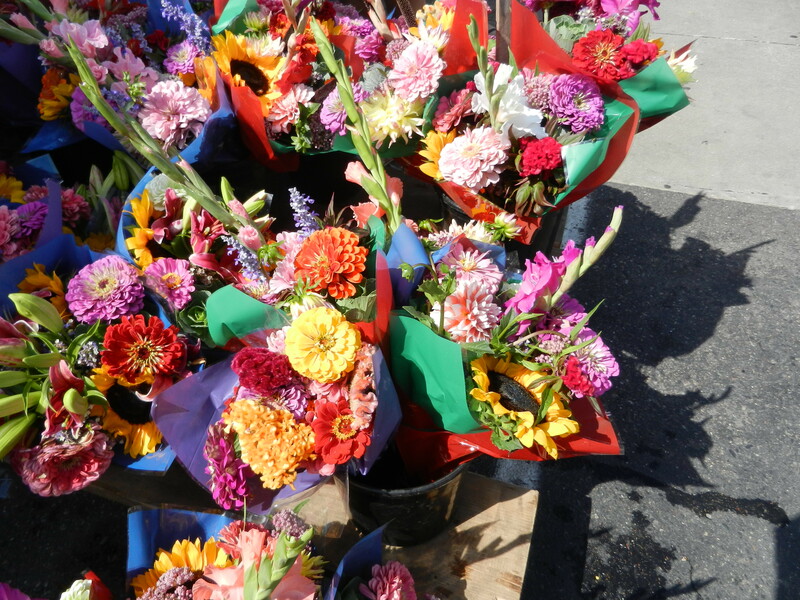 Wear gloves or use a spoon to scoop out the seeds if you handle these bad boys. I learned the hard way; wasn’t even thinking about the fact that these were spicy peppers, and ended up with a right hand that burned for a good hour. You’ve been fore-warned. Next, I sautéed 2 diced small onions with 3 minced garlic cloves. After about 4 minutes, I removed them, and added 1/2 of a pound of ground beef to the same pan (the less dishes the better!). I browned up the meat, then brought it to the sink so I could rinse and drain some of the fat off. I returned the meat and the onions to the pan, no longer on any heat. I then added 1 fresh tomato—-from our garden. 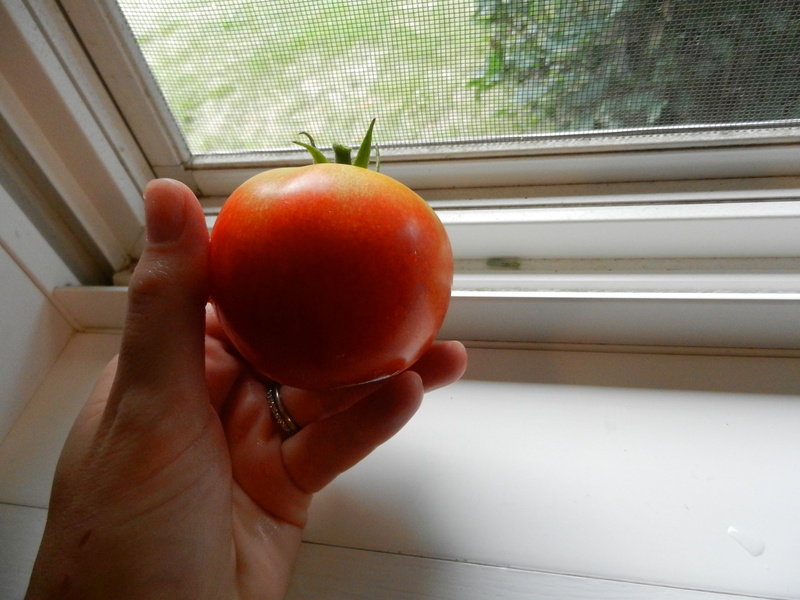 Our first normal tomato of the summer! And 1 tablespoon chopped fresh farmer’s market cilantro, 1 tablespoon salsa, 1/2 teaspoon cilantro, 1/4 cup shredded cheddar cheese, salt, pepper, and if I would have remembered I would have put a dash of chili powder in there, but I forgot. I mixed everything together to make the “stuffing” for the peppers. I stuffed all of the peppers using a spoon, wrapped them individually in tin foil, and placed them in the fridge for later. Next, I made a small batch of guacamole using 1 ripe avocado, 1 teaspoon fresh cilantro, lemon juice because I didn’t have lime, a dash of garlic powder, onion powder, cumin, salt, and pepper. I gave this all a mix, covered it and put it in the fridge. 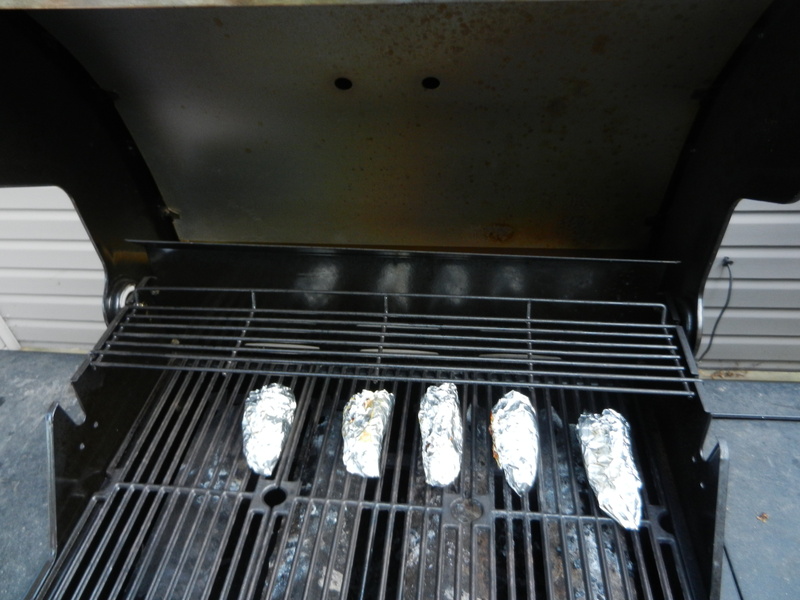 When we got home from church, and after running a couple of errands, we got the grill fired up. The peppers did their thing on the grill for about 20 minutes over medium-high heat. Transfer to your plate, remove the foil, top with guacamole and some salsa if you like, and there you have it. 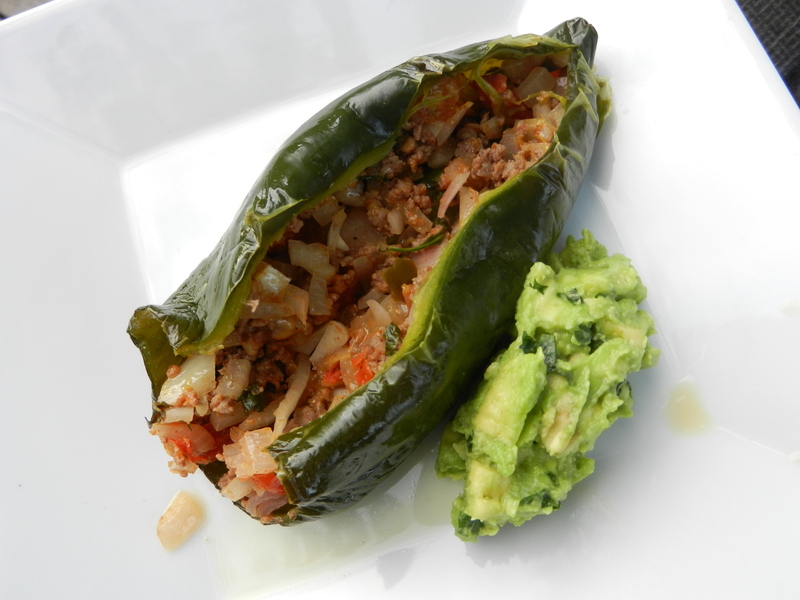 Deliciously healthy stuffed Poblano peppers. 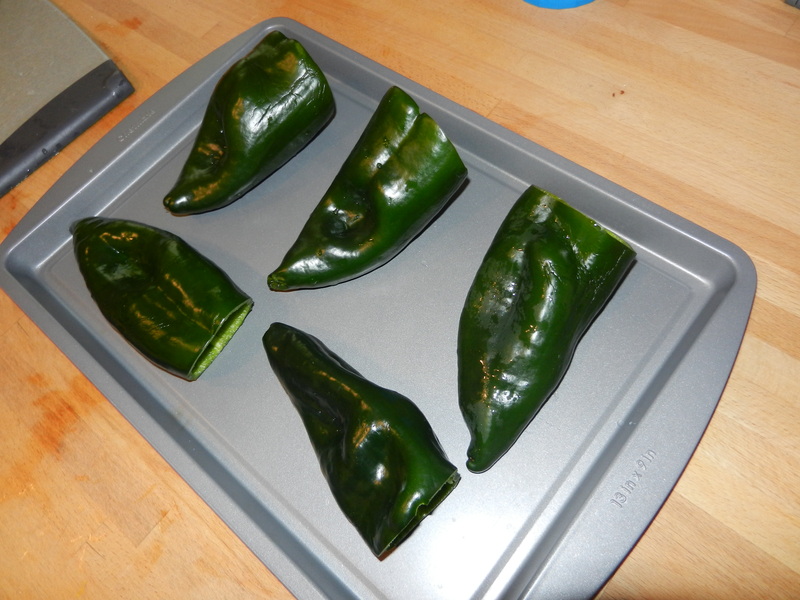 Place prepared peppers onto baking sheet and bake for 15 minutes. 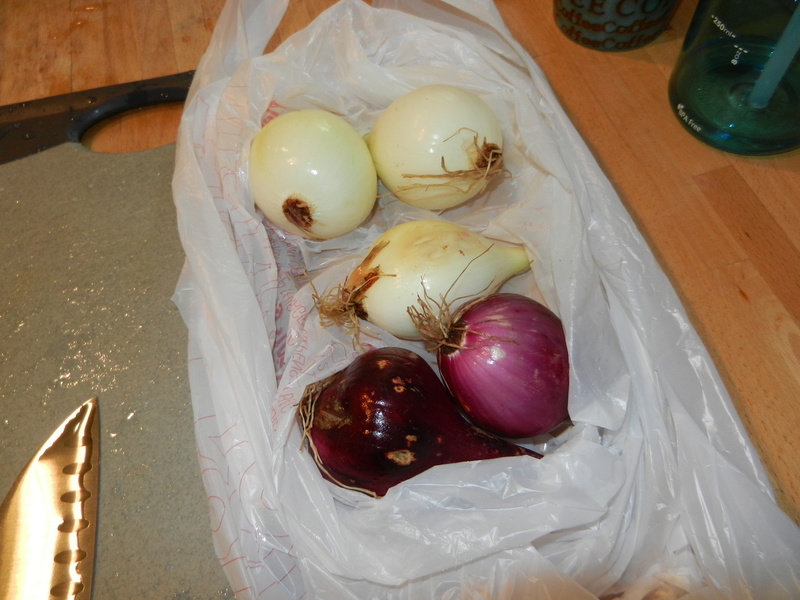 In medium pan, saute onions and garlic for 4-5 minutes; remove from pan, return pan to heat. In same pan, brown the ground beef; rinse and drain in sink, return to pan and take off heat. Add remaining ingredients including the onion and garlic, to the pan to make the stuffing. Once peppers are done, use spoon to fill peppers with stuffing. 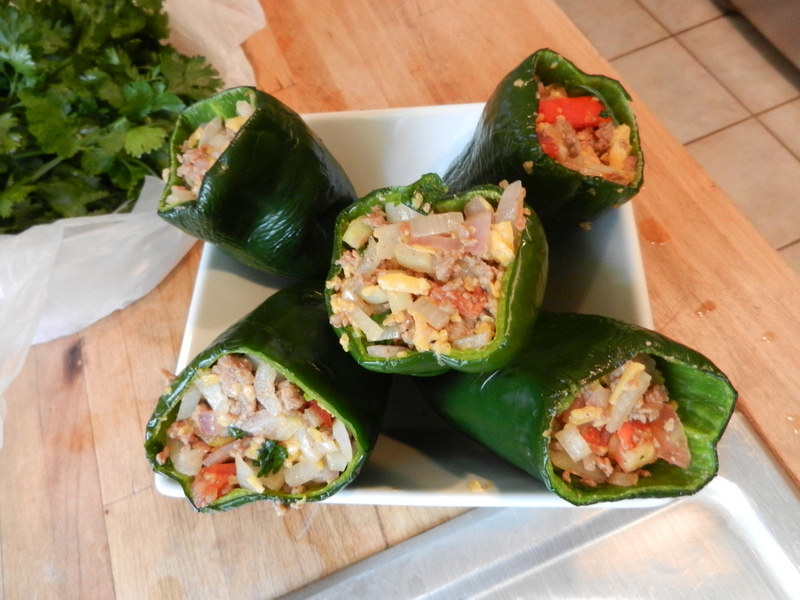 Wrap peppers individually in aluminum foil. Top with guacamole, salsa, or enjoy as they are! **These would also work in the oven, although I am unsure of the temperature and cooking time so you may have to experiment! 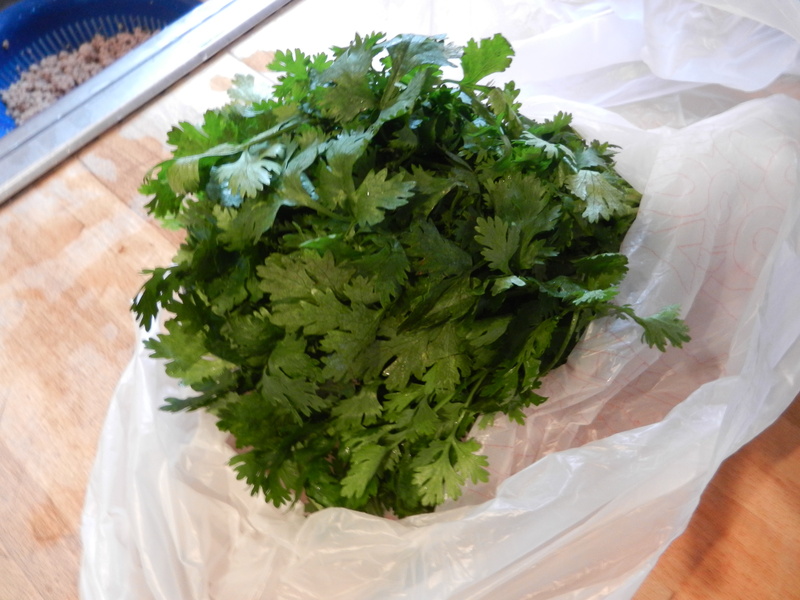 This entry was posted in Breakfast, Dinners, Recipes and tagged Food Trials, Life, Salads, Veggies by Melanie. Bookmark the permalink. Looks absolutly yummy I’d have to trick my husband to eat this but he may try this very soon! Thanks for all the awesome ideas you give daily. Thanks Carol and thank YOU for reading!